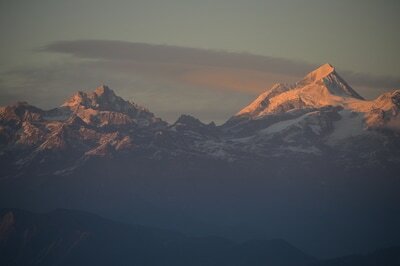 Whether you have only one day or several weeks, Nepal offers the best mountain viewing options in the world. From day hikes to see the Himalayas to up-close, personal encounter with the enormous masses of stone and ice, from mountain flights to world-class trekking to the Everest or Annapurnas; from the time you are preparing to land in Nepal, you will be blessed with gorgeous views. The Himalayas form the northern border of Nepal and Kathmandu is approximately 65 km in a straight line distance from the border so it is possible to get many fantastic views of the greater Himalayan range within a short driving distance from your hotel in Kathmandu. From Kathmandu a short drive to Nagarkot will take you to the rim of the Kathmandu Valley, with plenty of hotels to choose from and you could stay overnight to witness the incredible sunset and sunrise, this visit could be combined with a short tour of Bhaktapur. 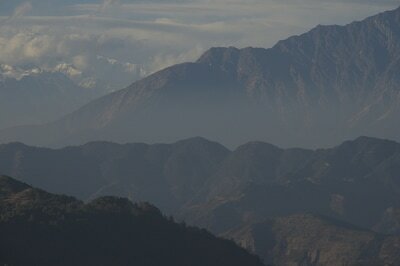 If temples of the kathmandu valley takes you deeper, the himalayas of Nepal will take you higher. Temple towns showcase the glory of Nepal’s architects and artisans whereas just beyond the valley rims lie Himalayan view points like Nagarkot which boasts one of the broadest views of the Himalayas with 6 out of 14 highest peaks above 8000 meter can be seen from here on a crystal clear day. 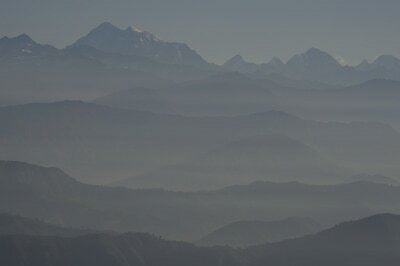 You can see the stretch of central Himalayas from Nagarkot. Nagarkot is the most famous hill station near from Kathmandu and One can see the beautiful stretch of central Himalayas: Manaslu range, Ganesh Himal Range, Langtang, Jugal Range, Rolwaling Range, Everest Range and Numbur Range from here. The highest peaks that can be seen here are Everest (8850m), Cho oyu (8), Manaslu (8156m), Annapurna(8010m), Dhaulagiri (8176m), shishapangma (8) along with lots of peaks above 7000 meters, 6000 meters. The crow fly distance of the mountains from Nagarkot ranges from 50km (jugal range of the nearest range of the Himalayas to the kathmandu valley) to 150km far (everest). Some famous that can be seen includes Numbur peak(6,958 m), melungtse (7200), gauri Shankar(7,134 m), dorje lakpa (6,966 m), langtang ri (7205 m), Phurbi Chyachu (6,722 m) , ganesh himal(7,422 m) , himalchuli (7900m), Gur Karpo Ri (6,874 m), Gyaltzen Peak (6,705 m) etc. The best time to see these majestic snowcovered peaks are in the mountains where all these peaks glow with the rays of sunshine gently spraying towards these peaks. The colour of these peaks changes from blue to grey into orange which is like fire in ice. It's like sun rays painting the canvas in the sky. It's this magical spectacle of orange ball of fire rising above the peaks with the surreal glow which will captivate everyone's heart and soul. To be surrounded in the natural surroundings with uplifting beauty looking this breathtaking splendor over the mighty mountains is a healing experience. I like to call it a nature therapy. May every sunrise brings you more hope and every sunset peace.